The walls are up and the vision John and Sarah Ramthun had for a new facility for their growing organization is finally taking shape. The new, 8,600 square-foot facility will serve as headquarters for 6:8 and the Sauk Prairie Area Food Pantry and features a main entrance/reception area, childcare room, teaching kitchen, dining room, classroom, office space, meeting rooms and an outdoor garden and orchard. The 6:8 organization was founded about seven years ago, said John Ramthun, 6:8 co-founder. The group helps spread an awareness of poverty and the challenges of those dealing with poverty with education, service and conversation. It helps coordinate, sponsor or is directly involved in community events such as Fire on the River, Sauk Prairie Against Hunger, Silver Cord and mission trips. The new 6:8 facility sits on a 1.5 acre-lot at 821 Industry Dr., in the Sauk City Industry Park. Currently 6:8 operates out of the Ramthuns’ Prairie du Sac home, while the food pantry is located by St. Vincent de Paul in Prairie du Sac. The space set aside for the food pantry in the new facility will more than double its current space, said Carol Gagnon, Sauk Prairie Area Food Pantry Director. Currently the food pantry occupies about 800 square feet and the new building will provide 2,000 square feet for it, increasing its capacity to serve more families. Another key factor is people using the food pantry will no longer have to wait outside in the elements before opening on distribution days, Gagnon said. John Ramthun said 6:8 is currently at $679,340 in or pledged funding, which is 85 percent of its $797,900 goal. This leaves the group with the remaining $118,560 to raise to complete the project. Along with individual donations of money or in-kind items, local businesses have also stepped up to help with 6:8’s capital campaign. Ramthun said Sauk Prairie Healthcare is just one of many local donors helping to make 6:8’s new facility a success: To date Sauk Prairie Healthcare has donated the equivalent of $25,000 worth of items in repurpose value necessary to furnish the building. Ramthun said in addition to the donations, Sauk Prairie Healthcare has generously agreed to store those items for 6:8 while volunteers slowly disassemble the unused items from the old hospital. The hospital did initially sell some of its excess items, first to employees and then the community. The majority of the items the Ramthun’s have salvaged are from the old surgery department, offices and exam rooms. Ken Carlson, vice president of planning and business development for Sauk Prairie Healthcare, said it was important for the hospital to be able to give back to the community. John Ramthun said getting the building to an operational state has been a little slow going, a lot depending on volunteer’s time and having the funding to pay contractors. “We’re working on getting it done as soon as possible,” John Ramthun said. Sarah Ramthun said 6:8 will hopefully have their grand opening in the spring of 2018. “It’s really been awesome for us when we first finished framing the walls and finally being able to see what it will look like when it’s done,” John Ramthun said. Sarah Ramthun said she’s been amazed at the community’s generosity and passion to help them. “I feel honored to be a part of that,” she said. The 6:8 non-profit organization is known for fundraising for food that travels the globe, planning the Fire on the River celebration and mission trips to help build houses for the poor. The program is headed by Shirley Kelter, a chaplain whose life’s work focuses on spiritual support for older citizens who may be home bound or in area care facilities. Kelter said her work helps to complement and collaborate with the support given by area pastors to help reach out to senior citizens that might appreciate the extra time spent with them. Kelter’s experience working with the elderly includes her work as a chaplain with Agrace Hospice in Madison and end-of-life issues. Contact the church office at 643-2439 by Monday, March 10 to register for both seminars. But she said her work is more about the life journey than it is about a person’s particular religious beliefs. 6:8 co-director John Ramthun said the organization added the program because they saw a need for helping the elderly members of the community. Kelter said the program includes visiting seniors who may be experiencing dementia or other memory loss conditions. Kelter’s mission is not only to help those in the aging process, but to lend support to their family members at the same time in end-of-life matters. She has two programs planned in March for both the elderly and their family members at St. John Lutheran Church. The first is “Aging in God’s Grace,” on March 12, a retreat for people in their 70s, 80s, 90s, and even the 100s. “It’s for those on the pilgrimage of life where aging can bring a host of challenges and loss, but also gifts and invitations from God, family, and community if we recognize them and open our hearts to receive them,” Kelter said. Betty Basarich, a Feed My Starving Children representative who works at a permanent food packing site in Libertyville, Illinois, shows the smiling face of a little boy in Haiti who nearly died until fed with the organization’s meals that more than 1,000 Sauk Prairie area volunteers helped pack and ship at Grand Avenue Elementary School on Oct. 30, 31 and Nov. 1. Donate to 6:8 hunger mission online at www.makingservicepersonal.org/donate-to-6-8. 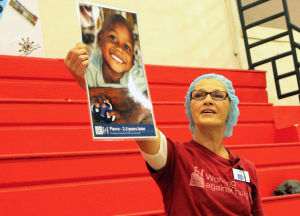 A gymnasium full of volunteers fell silent Oct. 31 as Betty Basarich held up photos of a little boy in Haiti who had been near death from starvation. Calling him Pierre, Basarich said when the Haitian boy was a year old, he weighed only 11 pounds. He turns five this month, the Feed My Starving Children worker said as she held up another photo of Pierre, his face more full and smiling brightly. “Pierre was taken to one of our medical clinics and he was diagnosed as being near the end of his life,” Basarich told the crowd of nearly 100 people. “So, he was given emergency treatment and fed our food." Pierre helped to a put a face to the goals of the 6:8 organization's Feed My Starving Children food packing event at Grand Avenue Elementary School held Oct. 30, 31 and Nov. 1. Basarich said Feed My Starving Children has also supplied what’s known as Potato-D and Potato-W mixtures that have helped Ebola-afflicted Liberia address symptoms from the disease. The event surpassed its goal of packing 350,000 meals by more than 31,000. John Ramthun, co-director of the 6:8 organization said the 1,200-plus volunteers completed more meals than the group had raised money for. Donations of $77,00 left the group in the red by $7,000 for the large number of prepared meals. On Nov. 3, Culver's raised a challenge to area businesses to chip in and donate. Whatever is donated, Culver's will match it dollar for dollar, up to $3,500. The 6:8 group packed its millionth meal in the three years it has hosted the event. In addition to the food packing for other less fortunate countries, the event brought in 8,096 cans weighing 3,515 pounds for the Sauk Prairie Food Pantry. "Our mission at 6:8 is feeding people locally and gloabally," Ramthun said. For the third year, Mueller’s Sports Medicine took first place in the Can Creation contest in which groups make artwork using canned goods. Mueller’s made a Jack-o-Lantern out of cans. Merrimac Charter School came in second with its food fairy can structure. Ramthun said other communities joined in this year, with churches in Lodi, Baraboo and Madison sending several volunteers. However, most of the volunteers were from the Sauk Prairie area, with many of them volunteering for their third time, and even working through multiple packing sessions. Les Muller of Frito Lay came from Rockford, Illinois to help pack boxes with other Frito Lay employees. He said his community observed Halloween a week early, so he had the time to spare. “I love kids and I love doing this kind of stuff,” Muller said. Kim Peck of Prairie du Sac also works for Frito Lay. He’s volunteered for the event all three years. It was the first food packing event for Christina Brotherton of Prairie du Sac, who volunteered with her husband and son. Jada Burch, 7, her brother Rylan, 6, and their grandmother Shirley Slaney volunteered for their second packing shift of the day. “I want to do this for a long time,” Jada said. 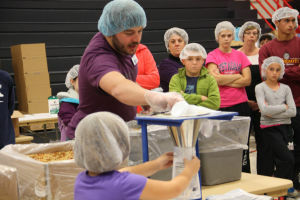 Last year, Danny Pyne with the Feed My Starving Children organization of Chicago, showed local Sauk Prairie Against Hunger volunteers how to package meals that will be shipped around the world. October may be the busiest month of the year for organizers of the Sauk Prairie Against Hunger program, but the group’s efforts in providing food to low income families goes on all year. Sauk Prairie Against Hunger is operated as part of the 6:8 Making Service Personal organization. The group is looking for volunteers to help with its annual packing event that provides food to the Sauk Prairie Area Food Pantry and sends packs of food items to under developed countries experiencing food shortages. This year, 1,500 volunteers are needed Oct. 30, 31 and Nov. 1 for the Feed My Starving Children food packing event at Grand Avenue Elementary School. The group plans to pack 350,000 meals to be shipped around the world. Last year, more than over 1,000 volunteers packed 217,000 meals, and the goal this year is 1,500 volunteers who work a two-hour shift packing the food. During that same weekend, a Can Creation food drive will be held in which local groups use canned food products to create artistic displays. The displays are judged and their creators are awarded prizes in categories of artistic creativity of display, total number of items and total weight. 6:8 co-executive director John Ramthun said 5,000 pounds of food was collected last year at this time, and the goal this year is 6,000 pounds, all of which will be donated to the Sauk Prairie Area Food Pantry. Ramthun said the food packing weekens is a big part of the group’s activities, but there is much more work that goes on year-round to help feed families in the Sauk Prairie School District. The group works with the school district to determine families with the greatest need and four times per year gives out backpacks of food items and gift certificates for both the Piggly Wiggly in Sauk City and Sentry Foods and Wyttenbach Meats in Prairie du Sac. Ramthun said the backpack is funded entirely by $77,000 in annual donations to the group. So far this year, the effort has raised more than $62,500 toward that goal. The group also plants a garden of vegetables at St. Johns Lutheran Church and holds food and donation events throughout the year to meet its goal of reducing hunger in the local area and globally. Last weekend in Madison, more than 100,000 meals were packed for hungry people at home and around the world. A good number of the meals are going to children. Many of the meals were packed by children. Saturday, March 16, was the second annual Lenten “Feed My Sheep” food-packing day at the Catholic Multicultural Center (CMC) in Madison. The driving force behind the event is “6:8,” a group based out of Prairie du Sac that spearheaded a fundraising event and brought the money needed for the 100,000 meals. Last year, the group raised enough money to package more than 68,000 meals. The executive directors of 6:8 are the husband and wife team of John and Sarah Ramthun. As volunteers, including many children of all ages, poured into the chapel at the CMC for orientation, John shared the message of 6:8: “We desire to transform communities by making service personal,” said John. To put numbers and faces to the reality of hunger in the world, volunteers from Kids Against Hunger in Rock County shared some facts with the soon-to-be food-packers. While some of the meals will stay in the Madison area, many of them will go to a school in Nicaragua. Volunteers told stories how some kids in the Central American country have to begin their days in a dump, looking for items to trade or sell in order to have food. The meals shipped there will go to a school started by a Catholic priest. School attendance is reportedly higher when meals are provided for the children. 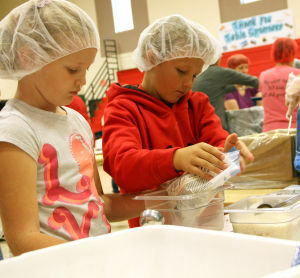 The Rock County chapter of Kids Against Hunger helps provide the meals for packaging. The total cost of one meal is a quarter. It contains a simple combination of rice, soy, vegetables, and a chicken flavoring. The flavoring is actually vegetarian and vegan friendly. After the volunteers watched a brief training video on how to package the meals, it was time to put on the hairnets and gloves. Kids were the backbone of the operation as many parents brought their children along to help and also Confirmation groups provided their time and talent. Almost two-dozen assembly lines were in action packaging the meals. Some volunteers poured the ingredients into a bag; others weighed the bag and sealed them up. A favorite job of the smallest helpers was stacking the bags at the end of the table to make sure the output was at the necessary 36 bags to put in one box. Each table yelled “Do you love me?” around eight times per shift. That adds up to more than 1,700 meals packaged by each volunteer group. For most volunteers, the time went by fast, especially once the reality sets in that the groups are really “making service personal.” The work being done will help people who are hungry, many of them the same age as the young volunteers. At least 55 boxes of food, or more than 12,000 meals, will go to the St. Vincent de Paul Society in Madison, while 25,000 meals will help the hungry kids in Nicaragua. “We’re making a difference, we’re not just having a good time, we’re impacting the world, which is kind of amazing,” said Ramthun. He expressed a hope of someday packaging one million meals in a weekend. No doubt a lofty goal, but the potential is there.